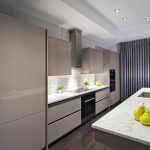 At some point in your home’s lifetime, you may feel that the kitchen is not meeting it functionalities adequately, or has become a bit dated in style. A kitchen remodeling project can turn your kitchen into a more functional and stylish place. But this is usually a big project that needs careful planning to avoid wasted money, time and effort. If you decide on doing a kitchen remodeling project, here are a few questions to help get it right. These days, a kitchen is never a purely cooking space. It also acts as a socializing place where a few friends and family can meet and talk while preparing meals. If you plan on having a kitchen as a more of a serious meal preparation space, you will need more working and storage space; larger cabinets, sinks, and racks to keep appliances within easy reach. If it is more of a socializing space, an island countertop and seating spaces should be factored in. This is directly related to the size of the family or level of kitchen activity. If you need to store more supplies, factor in larger cabinets at the lower level to store heavier dry foodstuffs. Consider the number of appliances as well to keep hidden away and reduce clutter on the countertops. Remember that cabinets should add some style as well, so factor in cabinets that will display your fine kitchen items. If the space is not adequate for your remodeling plans, you will have to knock down and move a wall or two. Remember this will alter the house structure, and needs a permit. It will also alter your budget significantly. How will the kitchen connect to the rest of the house? Movement to and from the kitchen to the dining and family rooms should be easy to make serving easier. An open floor kitchen plan makes space between the kitchen and the other rooms more fluid, making it a more social space. But it can mean more of the kitchen smells wafting in the other rooms. If you plan on a higher level of cooking, it is a good idea to have the kitchen as a separate space. This will keep away kitchen noises and smells when there is serious cooking going on. The type of wood or materials for the cabinets, countertop materials and finishing all depends on the budget. It is a good idea to balance style and functionality in the budget. Do you need a kitchen remodeling professional? 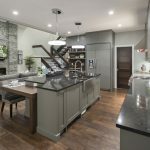 Contact Bow Valley Kitchens for a stunning and affordable remodeled kitchen.